People line up before a food distribution at Wat Kanlaya in Thonburi. 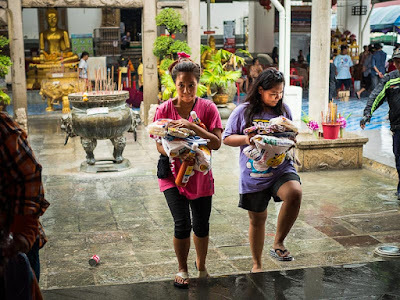 People who donated food to Wat Kanlaya pray before the food distribution at the temple. I went to Wat Kanlaya Friday to photograph the evictions going on near the temple. There wasn't much to photograph with the evictions, but there was a food distribution at the temple. The food distribution is interesting because it's not only food distribution but also a sacred religious rite. 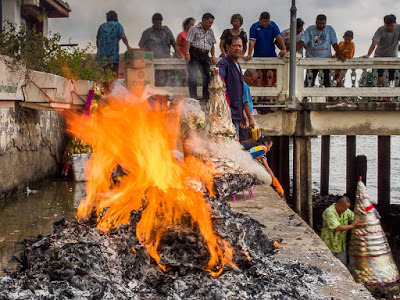 People burn "ghost money" as a part of the food distribution ceremony. I ended up photographing the food distribution. Many of the people in line for rice and staples were the same people I photographed earlier in the week during the evictions. As food distribution days went, this was a pretty small one. 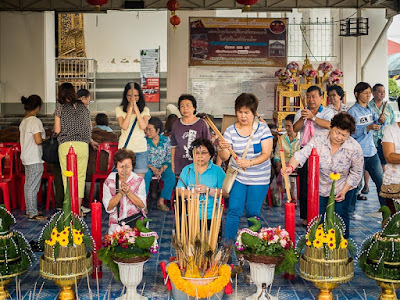 I've photographed some, at other Chinese shrines in Bangkok, that went on for hours and served thousands of people. 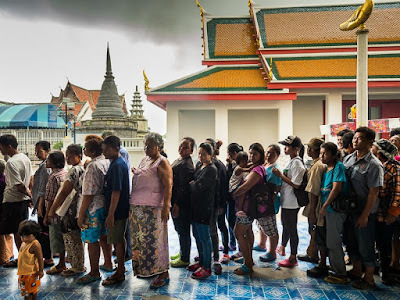 There were a couple of hundred people in line at Wat Kanlaya and the food was gone in about 30 minutes. 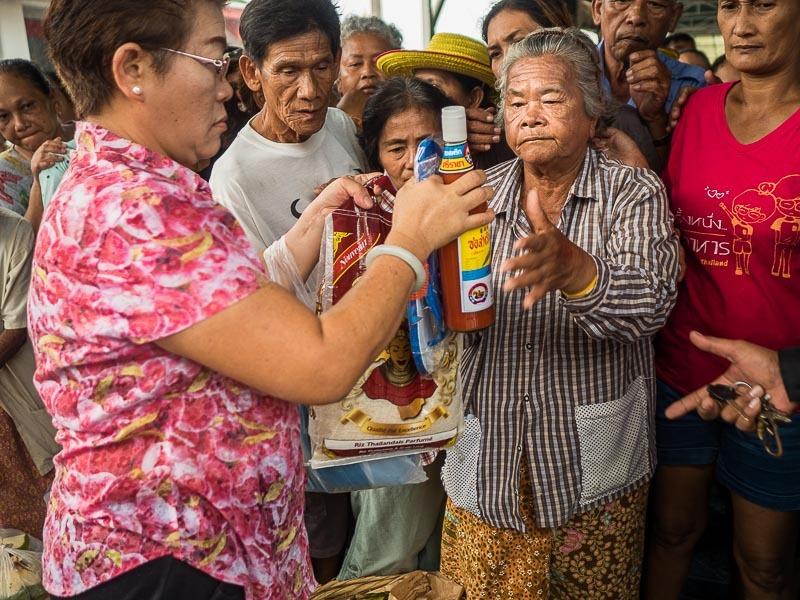 A woman gets rice and hot sauce during the food distribution. Check out how big the bottle of hot sauce is! Everybody got the same thing, a large bag of rice, a huge bottle of hot sauce, some fruit and a pair (or two) of flip flops. The flip flops were a new touch. I've seen children's toys included in the care packages before but never flip flops. Women leave the temple after the food distribution. One of the reasons I like working here is that you're never quite sure what you're going to stumble into on any given day. 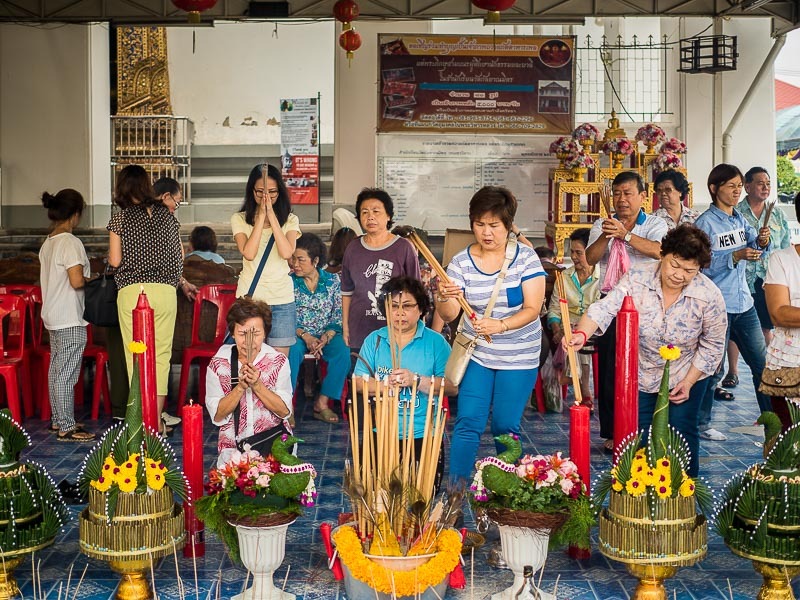 I went to the temple to photograph the forced evictions and ended up photographing some quite different.